Should I Still Hold My Open House In The Rain? Come rain or come shine…the real buyers will be out like the postal service. You may only get one visitor but you can be sure they are serious about buying. While you don’t want someone trudging through your home, over newly cleaned carpets and polished floorboards with wet, muddy feet; there are a few precautions you can take to protect your home while still making the prospective buyer feel welcome, warm and happy when they enter your home. 1) Make sure there is a good door mat outside all entrances to the home and a thin throw rug just inside the door if the day is rainy and muddy. This will keep people from tracking mud into the house. If you want to enforce a “No shoes” policy, by all means, do so. A polite sign at the door should suffice and you could even have a few pair of shoes already in place for encouragement. 2) For those with an aversion to taking off their shoes, station a basket of paper booties just inside every entrance, with a sign asking guests to don a pair over their shoes whilst in the house. 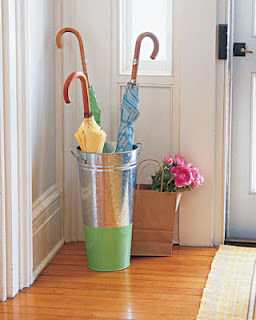 3) Have a few umbrellas just by the back door so that guests can check out the back yard without getting drenched. 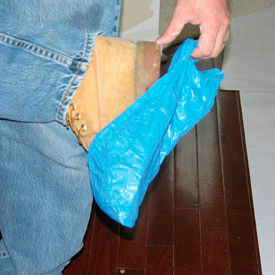 Have another basket where they can take off their booties before stepping out and put them back on when they reenter. And once again, a thin throw rug inside the door, and maybe even a few spare towels in case they need to try off. A dry, comfortable guest is a happy guest! 4) Make sure the thermostat is set at a comfortable level. While freshly baked cookies may be cliche, who can deny the appeal of stepping in from the rain and wet to a warm house smelling of freshly baked goods? 5) Have a flowering potted plan on the front porch to enhance and extend that welcoming warmth. While it may be uncomfortable and inconvenient to hold an open house on a cold and rainy day, there’s no denying that the open house guests who are willing to go out in bad weather to look at homes are usually serious buyers. You won’t see many “tyre-kickers” simply out looking at houses just because they have nothing else to do. And for prospective buyers, rainy days are actually the perfect time to go house hunting. This is the time you’ll get to see problems you’d never see when the sun’s shining – like roof leaks, overflowing/rusted gutters, and drainage issues both within the property and in the neighbourhood waterways.